A legendary document brought to the masses. Late one night last August, three Pentagram designers rummaging through the design firm's basement archives found the Rosetta Stone of New York subway graphics: the original Standards Manual, designed by Bob Noorda and Massimo Vignelli in the late 1960s. The 180-page binder, the key to the system's iconic design choices, outlines a meticulous vision of signage intended not merely to look good -- though it does -- but to simplify navigation of the subterranean labyrinth. In its attention to passenger behavior, the manual goes above and beyond what most of us would term graphic design. 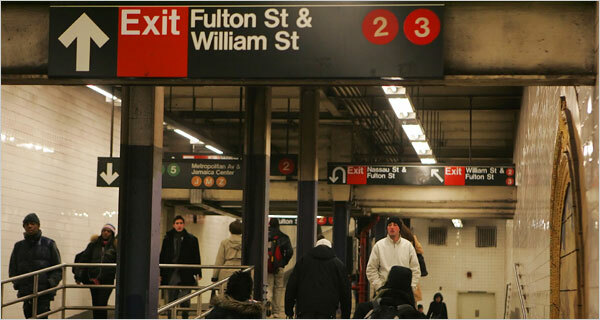 "The subway rider should be given only information at the point of decision," proclaimed the designers. "Never before. Never after." "Diagram of the Information Tree" for the Times Square station, from page 2 of the NYCTA Standards Manual. The existence of the book is well-known; its contents legendary. But apart from a few off-kilter snapshots posted to Flickr in 2006, images of the document itself were scarce. So when Niko Skourtis, Jesse Reed and Hamish Smyth found the 1970 manual in a locker beneath a pile of dirty clothes in the Pentagram basement, they did the world a favor and posted its pages, PDF by PDF, on a new website. "None of us had ever seen anything like that before," Skourtis says. "In its full glory." Nearly fifty years ago, the New York City Transit Authority hired Bob Noorda's Unimark International to develop a uniform system of signage for the subway system. Since the subway comprised what had been three separate systems -- the IND, the IRT, and the BMT -- the stations and trains were cluttered with conflicting, confusing instructions. Noorda and Vignelli made it look easy. They gave the system its sans-serif typeface (the sign-makers would not or could not yet print Helvetica, so the designers settled initially for Standard Medium), its color-coded disks,and its pared-down, modular signage. A wonder of precision, the Standards Manual even addresses the heights of conductors with and without hats. "It's pretty much a design bible as far as standards manuals go," Skourtis says. Some things have changed in the last fifty years. Standard Medium has been (rather famously) replaced by Helvetica. In an effort to discourage graffiti, signs now feature white lettering on black, as opposed to Unimark's prescribed black-on-white. The surest sign of the book's age? A mock-up sign warning readers: "Clerk not required to accept bills over 5 dollars." There are, the Manual stresses, six and only six ways to use these arrows. The designers even included some examples of ways not to use these symbols (at the bottom of the page). One imagines that the designers would also have forbade the now-common U-turn arrow, if they had foreseen its use. And unlike Vignelli's diagrammatic 1972 subway map, which has achieved immortality in the design world since it was banished in 1979, these symbols have garnered the affection of strap-hangers and typographers alike. The reaction to the published manual, Skourtis said, has been huge. "We've gotten a gigantic response -- the site crashed two or three times in the first week," he said. "We got a ton of emails. People were so happy to see the thing in its entirety." All images from the NYCTA Standards Manual.